In our previous blog posts in this series we looked at the most commonly used blended learning models, the flipped classroom and station rotation. In this and the subsequent post, we will be looking at particular contexts for instituting blended learning and discuss which models fit those particular uses. We will focus on the first three of these in this post and discuss the other three in our subsequent and final post of the series. The Station rotation model offers variety within a fixed structure. Instituting blending learning for children at this age is both easy and challenging; easy because the students are likely to be enthusiastic technology users, challenging in that attention spans are likely to be short. Another characteristic of this environment is that students will likely be using technology predominantly—or even exclusively—at school rather than at home. Given these conditions, the blended learning model normally most appropriate for elementary schools will be the station rotation model, in which students move in groups through different learning activities. Dividing the class into groups helps class management and provides a means to provide differentiated instruction. This model provides the benefits of having a variety of activities to keep students' interest and attention. It also provides frequent physical changes of location, as students move among stations featuring hands-on activities (through learning games, instruments, or other physical objects), digital materials (most often using tablets), and small group work. For elementary level teachers, adapting to this model is not a big shift in teaching practice, as most are already familiar with having students rotate through a number of "learning centers". Read more about the station rotation model. The Lab rotation model encourages a focus on learning. Middle school students are a notoriously challenging group to teach. They tend to be easily distracted and focus much of their time and energy on peer interactions. For this age group, a lab rotation model may work well. Not all middle schools have computer labs, but many do. The lab environment—compared to groups of tablet users—allows for easier supervision of student activities. This helps in having students focus their attention on learning rather than on socializing. As with this station rotation model, students will move through different stations following a regular schedule. Having a fixed and consistent schedule for moving among learning activities in a blended learning environment is helpful for elementary and middle school students. The set structure lets students know what to expect and serves to mitigate anxiety. 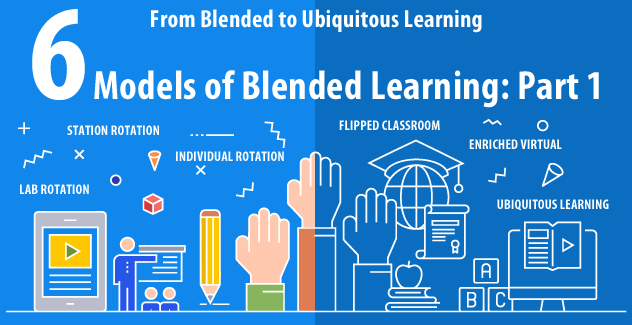 The Individual rotation model of blended learning provides flexibility and customized learning. For high school age students, a more flexible system may be more appropriate. At this age, students' interests have started to diverge. An individual rotation model works well in enabling the flexibility to accommodate different student needs, abilities, and interests. In this blended learning model, students do not move together through different stations, but can choose among different options. The degree of flexibility possible will depend on the resources available (number of teachers, para-professionals, computers) and on the physical set-up of the classroom and labs. The individualization can extend as well to the mix of online work outside of class and the in-person activities. Individual students may need more personal attention and help in the classroom, but others may be expected to work more independently, through channeling more learning activities through the digital environment. How this works out in practice will be determined by the discipline and learning goals. These suggestions should not be taken as guides to follow in all school contexts. What model of blended learning well work the best fit depends on the local situation. That includes such factors as the availability and set-up of computers or tablets, as well as the learning activities most appropriate for given subject areas. In any case, these models can be customized to local conditions. The Christensen Institute showcases how 5 teachers adapted the station rotation model to their specific needs. The Blended Learning Universe profiles 3 customizations of the individual rotation model. It is important that once implemented a blended learning model be evaluated to ensure that learning goals are being met. Such assessments can lead to important fine-tuning of models so that they work more efficiently in a given context. Cambridge Assessment recently provided useful suggestions and criteria for evaluating blended learning implementations. The University of Central Florida offers a valuable blended learning toolkit that includes evaluation resources. About Robert Godwin-Jones, Ph.D.: Robert Godwin-Jones, Ph.D., is a founding partner and responsible for product research and design. Prior to SoftChalk, Robert was a founding partner of madDuck Technologies where he was a co-developer of the Web Course in a Box Learning Management System. He is the former Director of the Instructional Development Center at Virginia Commonwealth University and is currently a faculty member in their School of World Studies. His principal areas of research are in applied linguistics and international studies. He writes a regular column on emerging technologies for the peer-reviewed journal Language Learning & Technology (llt.msu.edu) and blogs on intercultural communication at http://acrossculturesweb.com/wp/.